Junior guard Tommi Jepsen races past the Dayton defense for a basket on Tuesday, Feb. 6. 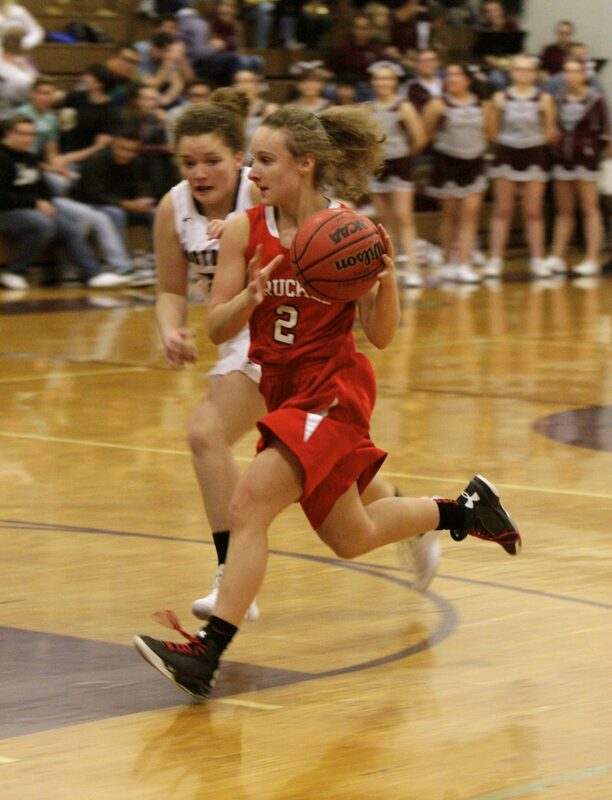 The Truckee girls’ basketball team snapped their four-game losing streak on Tuesday, Feb. 6, with a 44-18 road victory over Dayton. The Wolverines came into the game without freshman Emma Cooley, but got big performances from junior Ava Seelenfreund, freshman Annika Thayer and freshman Lauren Tanner to take the win over the Dust Devils. Tanner paced the Wolverines with 15 points on the night. Seelenfreund scored nine for the team, including six in the first quarter. And Thayer added nine points as well. Senior Izzy Abarno scored seven points for Truckee. The Wolverines held Dayton without a field goal over the first quarter to take a 10-point. Dayton would play better in the second and third periods, but couldn’t dig out of their double-digit deficit. Truckee went on to outscore the Dust Devils 14-2 in the final quarter. With one game left in the regular season, the Wolverines (11-12, 6-9 Northern League) are locked into the sixth and final Class 3A Northern League playoff spot. The girls will conclude their regular season at home on Saturday, Feb. 10, at 1 p.m. against Fernley. The Class 3A Northern League playoffs will begin on Thursday, Feb. 15 at Elko High School.